Features a built-in digital converter by Apogee. A rugged, dynamic handheld microphone combined with a built-in digital converter by Apogee. HANDMIC DIGITAL is the perfect companion for creating effortless mobile recordings and capturing brilliant interviews on iOS, Mac or PC. Professional quality made easy. Just plug and record. 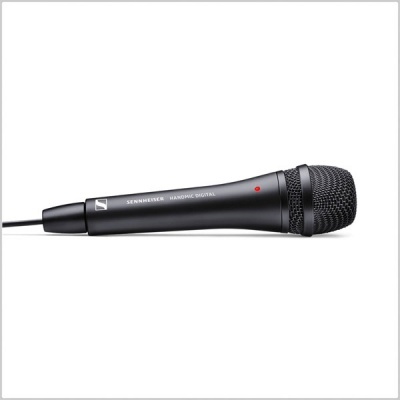 A simple, elegant solution for content creators that want professional results, HANDMIC DIGITAL was developed by Sennheiser and digital audio technology leader Apogee. Featuring a 24-bit/96 kHz capable digital audio converter (DAC) inside an all-metal housing, HANDMIC DIGITAL puts everything you need for studio quality audio in the palm of your hands. Use your favorite apps to capture audio on your iOS device via the included Lightning Cable or swap out to the USB cable and connect to your Mac or PC. The choice is yours for simple, straightforward ease of use and seamless workflow from start to finish. A form factor you can be comfortable with that looks as professional as it sounds - HANDMIC DIGITAL is the perfect audio complement for your mobile journalist toolbox. With excellent noise rejection and suppression from wind, your audience can focus on your message instead of distractions happening outside your shot. High quality audio from the start means you spend less time editing and more time on the content that matters to your audience. The high quality and rugged design of the HANDMIC DIGITAL makes it perfectly at home wherever you are. 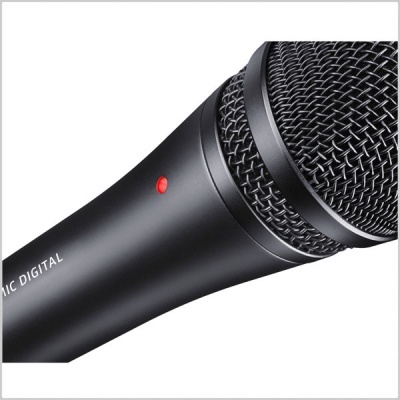 Features like our shock mounted capsule and shielded electronics mean that you’ll get professional results without distracting handling noise, buzzing, hiss or pops – just pristine, clear audio to help elevate your views. Portability or sound quality? You don’t have to choose between the two with HANDMIC DIGITAL. Capture that new idea before it slips away with the other would-be hits you forgot over night! A simple, superfast solution that can be ready to record your next great idea in an instant on your iOS device, Mac or PC. Whether a mobile journalist, podcaster, vlogger, musician, voice over artist, content creator or anything in between, we can all benefit from simplifying our workflow to focus on what matters most: our message. 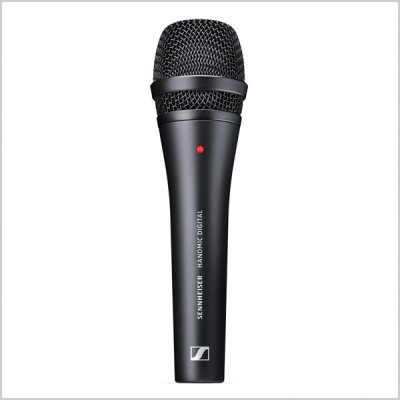 Sennheiser and Apogee have collaborated on this product to save you time, energy and frustration by combining award-winning microphone technology with a world class digital audio converter that fits in the palm of your hand. When you’re ready to share your message with the world, HANDMIC DIGITAL ensures every detail will be heard.